This is another tester recipe for Crack of Noon. It involved a first for me – making my own seitan. There are practically as many methods for making seitan as there are people who make it, and I think that’s one of the reasons I’ve put it off for so long. Anyway, I decided to take the plunge and used the Veganomicon recipe. It was easy and quick to make but a bit soft and spongy. Still, as a first attempt it wasn’t too bad. I used the seitan in this taco recipe. The sauce was really rich and powerful – lots of herbs and spices including one of my favourites – chipotles. I think you could use TVP chunks or tempeh for the filling – I’m even going to stick my neck out and say you could probably use slightly mushed kidney beans too. The grilled pineapple salsa was a revelation. 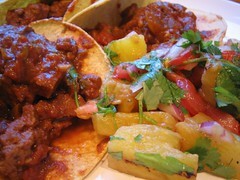 The juicy pineapple cut through the richness of the taco filling instantly. I used corn tortillas for the shells. I buy real corn tortillas in bulk from Mexgrocer and freeze them. I just heated them through in the oven and they even obliged by curling up to be a taco shape for me! This was a lovely meal and is sure to be repeated in our house many times. This entry was posted in Crack of Noon, Veganomicon by efcliz. Bookmark the permalink.